Glinde, July 3rd, 2018 - be quiet!, the market leader in PC power supplies in Germany for twelve consecutive years*, announces Dark Base Pro 900 rev. 2. 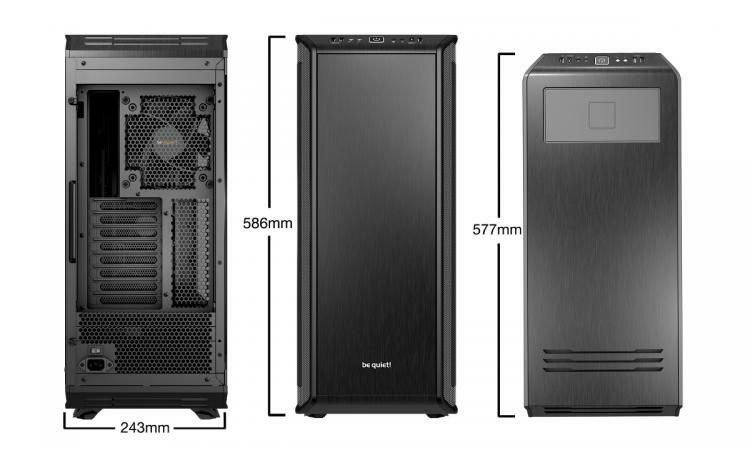 This updated PC chassis implements significant upgrades, emphasizing its pole position in the modular and silent full tower case segment. With the release of Dark Base Pro 900 rev. 2 and its introduction of new and innovative features, be quiet! successfully demonstrates how forward-thinking and listening to customer and industry feedback improves overall end-user experience. Like the original case, Dark Base Pro 900 rev. 2 leaves nothing to be desired due to its modular design, enabling numerous options for optimal component placement. The removable motherboard tray is installable in six different positions, accommodating all types of motherboard form factors, up to E-ATX or XL-ATX. Dark Base Pro 900 rev. 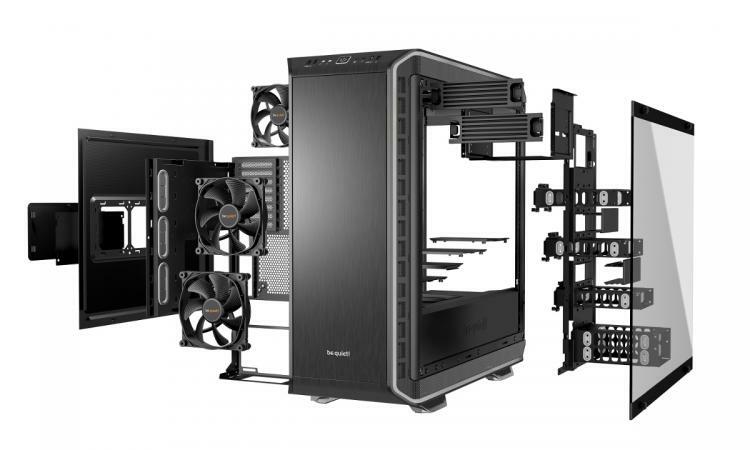 2 offers unbeatable flexibility and compatibility, providing a perfect enclosure for enthusiast-level configurations, water cooling and overclocking builds, whisper-silent systems and higher-end workstations. For storage components, the case offers abundant mounting space, supporting the installation of up to 14 solid state drives, seven HDDs, and two optical drives. Invertible along with the motherboard tray, one new feature is the highly requested PSU shroud used to hide cables and drives. The power supply cover also offers additional mounting options for an SSD and 120mm fan. Unused drive slots are now equipped with partially or fully removable HDD slot covers, covering unused mounting holes for a clean interior and perfect cable management. Another Dark Base Pro 900 rev. 2 highlight is its set of three pre-installed Silent Wings 3 140mm PWM fans, contributing to the flagship case’s sophisticated cooling concept and perfect airflow. With a unique rotor blade design, rubberized frame and funnel-shaped air intakes, these fans work silently and efficiently. At the same time, the 6-pole motor and advanced fluid dynamic bearing (FDB) reduce power consumption and vibration. The revised case’s pre-installed fans’ maximum rotations per minute were increased from 1,000 to 1,600 RPM, striking a balance between silence and performance. Dark Base Pro 900 rev. 2’s comprehensive airflow design is complemented by L-shaped vents in the case, providing additional noise reduction. The new chassis also comes reinforced with insulating foam mats at the front, top and side and uses specific decoupling mechanisms for key components. Additionally, the case includes a stepless fan controller, now supporting a total of eight PWM fans, as well as providing two configurable cooling zones using silence and performance modes. Dark Base Pro 900 rev. 2 also provides ample interior space, making the chassis suitable for powerful multi-radiator-using water cooling solutions. Dark Base Pro 900 rev. 2 is a technical masterpiece, standing out amongst its competition due to its high-quality materials and design. Smooth aluminum surfaces and a robust steel construction lead to extraordinary elegance and stability. Additionally, be quiet!’s high-end premium chassis is equipped with a decoupled tempered tinted glass side window, now painted black at its top and bottom, perfectly hiding screw holes underneath. Expandable LED strips running at 12 volts are included, illuminating the interior with different colors, easily synchronizing with popular RGB controller ecosystems and components. An inductive charging station is placed on the case’s top area for wireless charging of smartphones and other Qi-compatible devices. Also, the previous model’s two front panel USB 2.0 connectors are replaced with a USB 3.1 Gen. 2 Type C connector and a quick charging option, while the case is offered in variants featuring orange or silver highlights, as well as an all-black version. 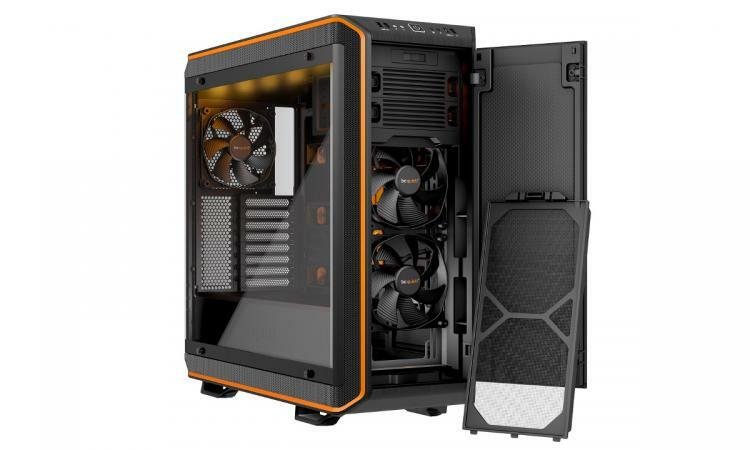 For owners of the original Dark Base Pro 900, the new PSU shroud, windowed side panel, HDD slot covers, and additional HDD cages are separately available through retail channels along with the launch of Dark Base Pro 900 rev. 2. Dark Base Pro 900 rev. 2 is available immediately at a recommended retail price of €269 / £259 / $269.